Place your cursor over the image for the answer! Bing Crosby has sold close to one billion records, tapes, compact discs and digital downloads around the world. He may be the biggest selling recording artist of all time. Only The Beatles, Elvis Presley and Michael Jackson can rival Bing’s sales figures. Bing had sold 200 million records by 1960 and the figure had doubled by 1980. His version of “White Christmas,” written by Irving Berlin, remains the bestselling recording of all time with The Guinness Book of World Records reporting worldwide sales of over 50 million singles. Total estimated sales of the song are near 100 million. “White Christmas” has entered the American pop charts 20 separate times and reached the No. 1 spot three times, in 1942, 1945 and 1947. Having made over 2,000 commercial recordings and approximately 4,000 radio programs in addition to an extensive list of film and television appearances, Bing Crosby is the most-recorded performer in history. Bing Crosby scored 41 No. 1 records (43 including the second and third chart-toppings of “White Christmas”) — more than The Beatles (24) and Elvis Presley (18). His recordings reached the charts 396 times, more than Frank Sinatra (209) and Elvis Presley (149) combined. Bing’s closest rival is Paul Whiteman (220) with whose orchestra he sang early in his career. Bing’s records hit the Top 10 203 times and spent 173 weeks in the No. 1 spot. 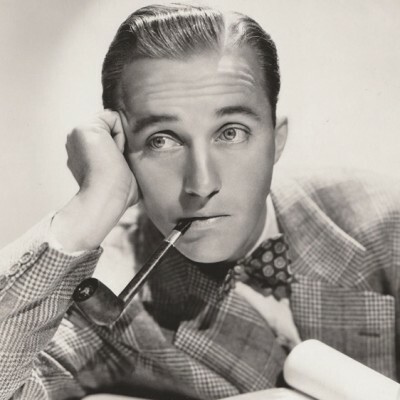 Bing was the voice of 13 Oscar-Nominated songs, four of which won the Academy Award for Best Song: “Sweet Leilani” (Waikiki Wedding, 1937), “White Christmas” (Holiday Inn, 1942), “Swinging on a Star” (Going My Way, 1944), and “In the Cool, Cool, Cool of the Evening” (Here Comes the Groom, 1951). Bing Crosby has been honored with three stars on Hollywood’s Walk of Fame: one for recordings, one for radio and one for motion pictures.